Although socio-political organization has been a principal topic in the history of Cretan Bronze Age research, its direct relation to the basic unit of society, i.e. the household, has been hitherto disregarded. Focusing on the Neopalatial period, this paper discusses the theories proposed in recent studies, which nevertheless employed evidence from domestic contexts to explore social organization in different regions of the island. The paper reviews the relevant evidence and re-addresses the issue using anthropological and historical examples, providing at the same time a methodological framework for the reconstruction of the household form and for its employment in defining social structure in prehistory. APOSTOLAKI, Emmanouela. On the Household Structure of Neopalatial Society In : Minoan Archaeology : Perspectives for the 21st Century [en ligne]. Louvain-la-Neuve : Presses universitaires de Louvain, 2015 (généré le 21 avril 2019). Disponible sur Internet : <http://books.openedition.org/pucl/3051>. ISBN : 9782875585394. Apostolaki, Emmanouela. “On the Household Structure of Neopalatial Society”. 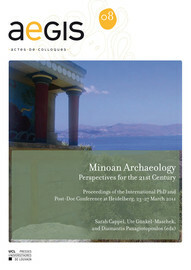 Cappel, Sarah, et al.. Minoan Archaeology : Perspectives for the 21st Century. Louvain-la-Neuve : Presses universitaires de Louvain, 2015. (pp. 223-239) Web. <http://books.openedition.org/pucl/3051>. CAPPEL, Sarah (dir.) ; GÜNKEL-MASCHEK, Ute (dir.) ; et PANAGIOTOPOULOS, Diamantis (dir.). Minoan Archaeology : Perspectives for the 21st Century. Nouvelle édition [en ligne]. Louvain-la-Neuve : Presses universitaires de Louvain, 2015 (généré le 21 avril 2019). Disponible sur Internet : <http://books.openedition.org/pucl/2999>. ISBN : 9782875585394.